The construction of buildings lost in the A-bombing and of newly planned hospitals and cultural facilities was initiated. 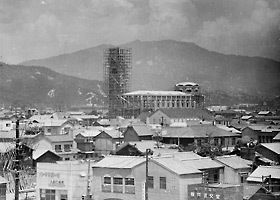 Many public facilities were built on nationally-owned land that had been conceded under the Hiroshima Peace Memorial City Construction Law. Some buildings were completed with the help of the goodwill of Hiroshima citizens and people worldwide who wished for peace. 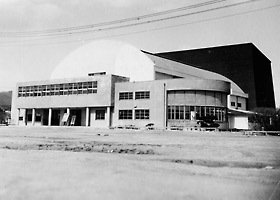 With the efforts of many people including teachers, this facility opened on May 3, 1948 as the first cultural facility built after the war. It was constructed at the northwest corner of the former site of the Western Drill Ground. Designed with curves, the wooden structure was used for various cultural events related not only to children, but also to the general public. The "Peace Apartment," constructed in Showa-machi, was the first municipal reinforced concrete housing in Hiroshima. In 1949, one wing was completed for 24 households, and the next year, two more wings which included 48 more households. Twenty times more people applied to the city for the apartments than there were units available. 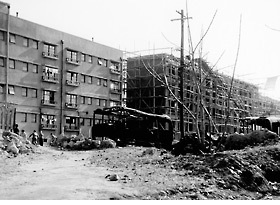 Hiroshima City Hospital was constructed on the site of the former Western Drill Ground. 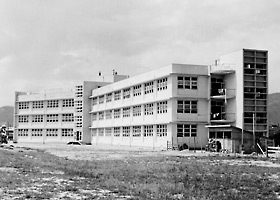 Construction commenced in April 1951. In June 1952, clinics and medical wards for internal medicine, pediatrics, surgery, obstetrics and gynecology were completed. On August 15 that year, medical practice started. This cathedral was constructed to commemorate the A-bomb victims and pray for everlasting world peace through the efforts of Reverend Hugo Lasalle and others calling for the world to help construct the cathedral. Construction was commenced on August 6, 1950. In 1953, a "Peace Bell" was presented by the city of Bonn, West Germany, and a consecration ceremony was held on August 6, 1954.